The Labour right, as ever more than happy to embrace defeat to undermine Jeremy Corbyn, has lost no time in talking up the defeat and what it supposedly says about Corbyn’s leadership. As ever, it’s complete nonsense. No surprise there, especially as Mr Akehurst was caught embarrassingly on camera during Al Jazeera‘s undercover operation into Israeli infiltration of the Labour Party. But his claim a stretch even by his low standards, as it has to ignore not one, but two very obvious actual facts that completely undermine his ‘alternative’ ones. Labour lost in Kersall by fewer than 300 votes. 354 went to an independent candidate who was not a factor in the last election there – and who was campaigning on a single, but to the residents of Kersall extremely important issue. So the result had everything to do with a local issue for which a lot of locals wanted to spank the council – not with supposed ‘antisemitism’ in the Labour Party. The independent candidate campaigned on that issue and took a significant share of the vote. Akehurst’s readiness to exploit and misrepresent a defeat to attack Corbyn will surprise no one. But he also cynically ignores a fact that even his own side – when they’re in a situation where they can’t help it – admits that there is no ‘antisemitism problem’ in the Labour Party. Last year, newspaper headlines were full of supposed antisemitism in the Labour Party. A report by the excellent Shami Chakrabarti was praised and welcomed by Jewish groups and others, in spite of concluding that there was no particular issue in the party – until it became politically convenient for right-wing Labour to smear her. Later in the year, a report by the CHAC (Commons Home Affairs Committee) was touted by the same, cynical media – and of course by Akehurst and co – as ‘revealing’ Labour’s ‘antisemitism problem’. Mr Akehurst knows this, of course. But he’s not prepared to let mere facts get in the way of a ‘good’ Corbyn smear. Akehurst and the right are also happy to ignore what else is happening in other council elections around the country. Of course, this was conspicuous by its absence from right-wing timelines. Curiously again, the media and Labour right have failed to mention these drastic Tory set-backs and massive wins for Labour and others. You’d almost think it didn’t fit a pre-planned narrative or something. 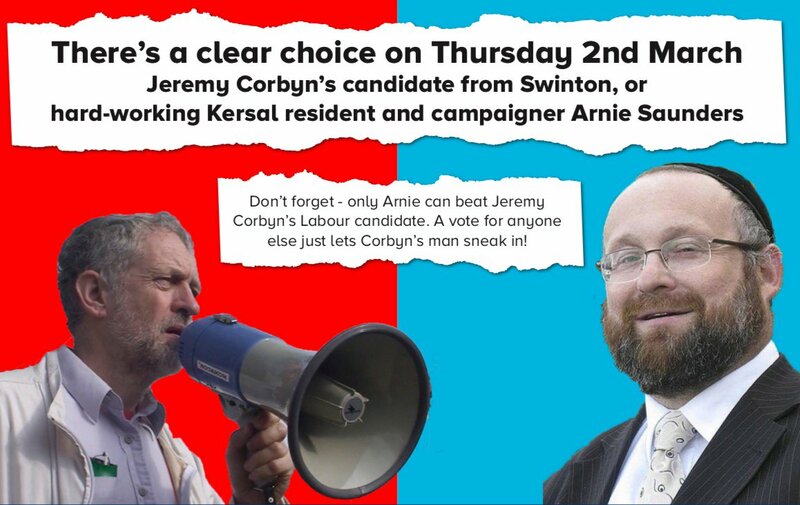 Did Labour lose any Jewish votes in Kersal? Probably – if saboteurs cynically tar their brush with lies, some people won’t know any better than to believe the completely baseless antisemitism smears – but given the context seemingly not that many. If we didn’t have Akehurst and co, with their media cheerleaders, to put us right, you’d think the latest by-election results and the ensuing comments actually damn Labour’s crypto-Tory ‘right-whingers’ rather than Jeremy Corbyn. This blog is BONKERS. Rebecca Long-Bailey cannot organise a Labour victory in her OWN constituency. Brand Corbyn is toxic on the doorstep and we are further away from a Labour government than anytime since the Second World War. As always throughout the history of our party, you people on the raving left will only accept you’re wrong after we’ve spent 20 years in the wilderness and Britain has been ravaged by un-checked Tories. That’s the Tories not naming the local Labour candidate, but calling him “Jeremy Corbyn’s candidate”. Picture of Corbyn and the local candidate very obviously Jewish Tory Candidate. I should be clear here- I hate this sort of stuff. It’s like George Galloway trying to turn London Elections into a referendum on Zionism. But they have a strong sense that it works, clearly, and it’s mining a ready seam of unpopularity of Labour under Corbyn among Jews. See here- and this by the way, is from May 2016 when, per Corbyn, Labour was doing very well. That shows Jewish support at less than half it was at the General Election. And I’m not approving the Jewish Chronicle, or its awful editor, Stephen Pollard. I’m quoting a poll by the reputable Survation. I agree with you that the Chakrabarti report had a good reception, and is doubtless good. But can’t you see how this looks? Report written by somebody touted as independent, only for Corbyn to make her a Labour peer, and for her to become one of his most conspicuous media supporters? That isn’t good enough, agreed? It’s like he doesn’t care about the report being undermined. You get outliers, of course, with council elections, and low turnouts.. The thing is that the Kersal result is pretty much in line with the data on how Corbyn goes down among Jewish voters. I don’t know it was that, nobody does. But it looks pretty likely to be a significant part of the explanation. Just like Muslim opposition to Labour growing at the time of the Iraq War, perhaps? You don’t have to approve of Akehurst, or think Corbyn deserves his problems with Jewish voters. You just have to recognize there’s a problem there. It looks to me like you’re trying to avoid it, if what you put up here is the best evidence you have of a big local revolt on a football stadium. By the way, votes fell badly in all 4 elections last night. Nothing to do with Corbyn? He came up on a few Copeland and Stoke doorsteps too. Thanks for the info, Chris. No, it’s not agreed, I’m afraid. Nobody’s arguing that support among Jews has dropped. I would absolutely dispute, though, that it’s got anything to do with Corbyn directly and *everything* to do with the relentless spreading of the antisemitism smear by people like Akehurst, avidly consumed and regurgitated by the media. For antisemitism to be cynically exploited like this is absolutely shameful – all the more so when you consider how Jews have suffered from smears throughout history. Likewise the fabled ‘doorstep’. Lots of campaigners tell me Corbyn is a positive on the doorstep. Those who dislike Corbyn say they opposite. Neither is provable – but if anyone is responsible for that, it’s the right-wingers who have never wasted an opportunity to undermine and smear the man and obscure/misrepresent his policies. The football stadium issue is simple fact – and well backed up by the evidence available. As for the level of impact in the local area, it’s 41% Jewish and Labour lost by under 300 votes – fewer than the number who supported the anti-(Labour)council, anti-stadium independent. So if there was an impact on Jewish voters, it wasn’t the decisive factor. On the wider scale, off course there’s a problem. Its name is not Corbyn. That poll suggests a pre-existing poor level of support among Jews, but a worsening under Corbyn. Akerhurst is obviously awful and destructive and creates the impression that the party is some kind of anti-semitic hotbed. But there are others that will get noticed. How, for instance, does bringing Livingstone back in at high level look to them? The much mentioned Hamas/Hezbollah meeting probably looks very bad too. Independents running on local protests get votes across the spectrum, don’t they? “Football ground to hurt your houseprice” is probably a good line to Tories. Not that I approve the sentiment, but I’d rather it motivated voters rather than that appalling flyer I put up. So do we know if the voters came overwhelmingly from Labour? I think there’s a “Jewiish problem” in the seat, some of it attached to the leader. Did it “cost the seat”? Unlikely because it would have been felt in 2016. Maybe it got mobilized more effectively because the Tories weren’t busy fighting the whole council though? Maybe, Chris. But again, there’s reality vs perception and the ‘antisemitism problem’ is a confection of the right. Livingstone is a case in point – and Mann was the disgrace, along with the media that acted as if KL had said something he hadn’t, even if the actual statements were naive. Luke Akehurst is damaging the Labour Party and creating a Jewish problem that doesn’t exist, This little video puts some perspective from Jews themselves as to what critics of Israel are talking about, and put Akehurst’s pro Israeli group under the microscope as to who the real subversives are. Salford City are an ambitious non-league side who’ve quadrupled their attendances in the last few years, in a residential area. They still play on Saturdays. Which, of course, is the Jewish Sabbath. Explains part of this result-NIMBYism, which can strike anywhere anytime against a sitting Council which just waves development through without a thought-and New Labour were one of the worst offenders about that, Mr Akehurst!